CW, pulsed, and other time-varying microwave and millimeter-wave signals can be automatically measured by the 585C and 588C frequency counters. VCO measurements, chirped radar profiling, and frequency-agile system analysis are all made with unparalleled ease. Pulsed signals can be fully characterized, including carrier frequency, frequency linearity, pulse width, and pulse period. The 585C measures signals up to 20 GHz and the 588C’s range reaches 26.5 GHz with an option to extend to 170 GHz. 585C / 588C: full function pulse/CW counters with an optional internal delaying pulse generator for the ultimate in ease-of-use. 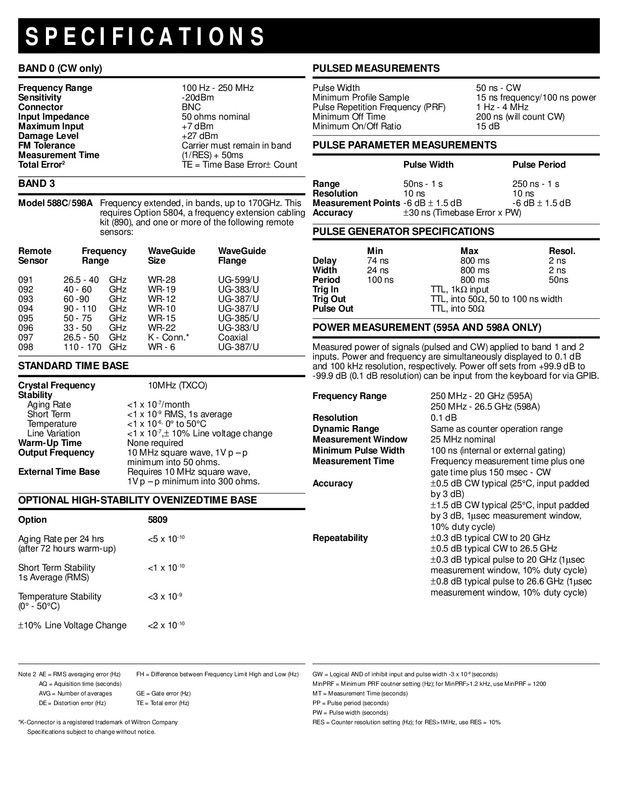 595A / 598A: add practical peak and CW power measurements to the capability of the 585C/588C. Phase Matrix brings to you the broadest spectrum of pulse and CW microwave and millimeter-wave frequency counters available today. 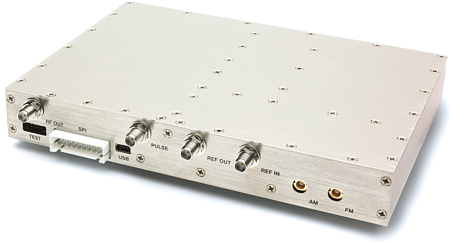 These models offer automatic and self contained frequency and power profiling that is ideally suited to such applications as chirped radar analysis, VCO measurement, and frequency agile system analysis over a frequency range up to 170 GHz (depending upon the model selected). 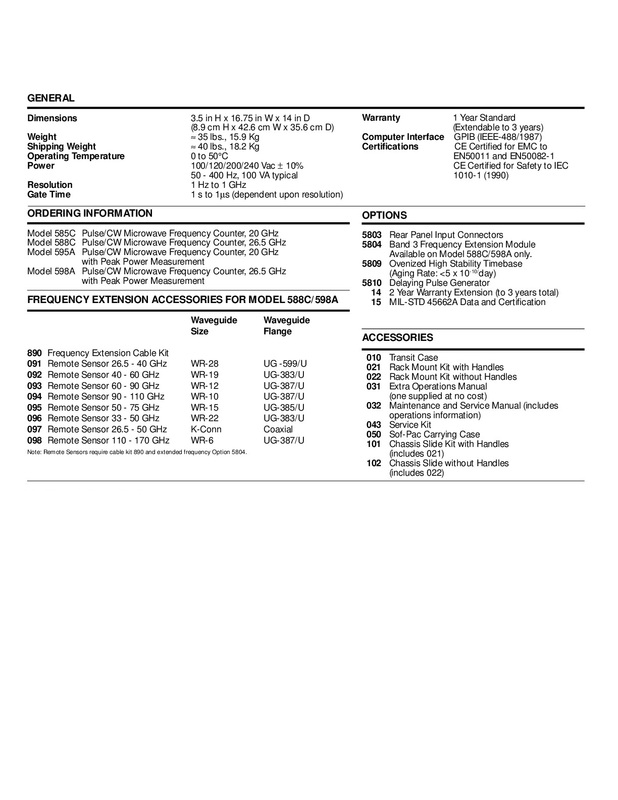 to 170 GHz The 588C and 598A extended frequency capability enables CW measurements from 100 Hz to 170 GHz, and pulsed measurements from 250 MHz to 170 GHz. Parameters such as frequency, power (595A/598A only), pulse width, pulse period, or PRF can all be measured fully automatically. The 585C/588C and the 595A/598A will detect and measure CW, frequency modulated, amplitude modulated, or pulsed RF signals with pulse widths as narrow as 50nS. The 595A/598A greatly simplify the measurement of peak power in your application. By measuring the frequency of the incoming signal, the instrument automatically corrects the power reading for the Calibration Factor of the internal sensor. You no longer have to manually enter the Calibration Factors or the measurement frequency. Careful design and internal calibration tables result in excellent accuracy and repeatability. The optional built in delaying pulse generator enables completely self-contained frequency and power profiling measurements. Synchronous outputs on the rear panel show actual measurement window for viewing on an oscilloscope. In addition, automatic measurements of pulse width, pulse period and pulse repetition frequency simplify your measurement task. True profiled measurements are possible with a sample window as narrow as 15nS. Careful design consideration was given to accurately and automatically measuring rapidly varying pulse bursts as might be typical in the generation of frequency hopping or wide band chirp signals. 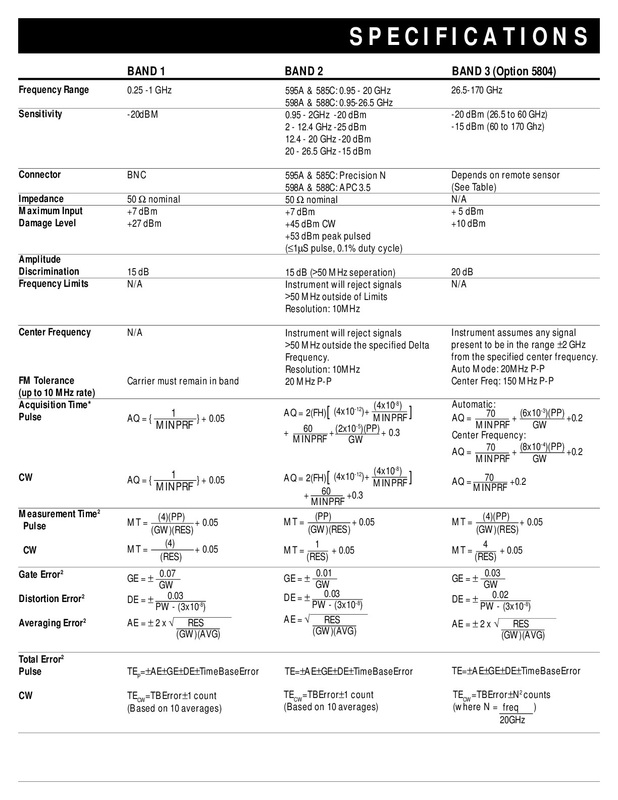 The Phase Matrix/EIP Model 595A/598A and 585C/ 588C actually reacquire the microwave signal for each measurement window, allowing, essentially, unlimited frequency changes from window to window. Competitive techniques require external gating if the frequency changes more than 10 MHz within the detected burst. 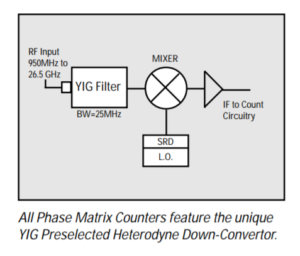 Only Phase Matrix/EIP counters utilize the proven YIG Preselected Heterodyne Down Conversion technique. This spectrum analyzer type preselector prevents harmonics and other spurious signals from interfering with the measurement of the desired signal. Additionally, it totally eliminates “kickback” noise. Furthermore, this frequency selectivity allows the user to select any desired signal for measurement of both power and frequency in a multi-signal environment. The YIG filter provides effective power limiting to protect against burnout due to accidental application of high-level signals, yet does not reduce sensitivity. This greatly reduces down time, especially in the hands of unskilled operators. At remote sites, this high-level burnout protection often proves invaluable by reducing the need for additional trips if a high power signal is accidentally connected to the counter’s input. The Phase Matrix/EIP 595A/598A and 585C/588C are in full EMI/RFI environmental compliance with MIL-STD-461 and MIL-T-28800, Type III, Class 5. As well as CE certified to EN50011 and EN50082-1. These counters have been optimized for integration into ATE systems and have all the systems characteristics you need for your test applications. All front panel controls, data output format and special functions are controllable over GPIB. Also, rear panel inputs simplify the integration of your system. Optional ovenized time bases provide higher accuracy and lower cost of ownership. The time base component of error is dramatically reduced with these high-stability time bases. The only periodic maintenance required on the 595A/598A and 585C/588C is time base calibration. With aging rates as low as 2 x 10-7/year, the calibration cycle can be extended to two years while maintaining kHz accuracy on a 20 GHz frequency measurement. The predecessors to the Phase Matrix models 595A/598A and 585C/588C , (EIP 585 and 588, introduced in 1985), have become standards of reliability, achieving a field proven MTBF in excess of 40,000 hours. Phase Matrix is so confident in the quality and reliability of these products that we back them with an optional three year warranty. 1. Automatic Pulsed Millimeter-Wave Counting up to 170 GHz with the addition of the Model 890 cable kit and one or more harmonic mixers. Large amounts of “chirp”, often encountered in millimeter-wave signals, can be precisely counted using Center Frequency Mode. 2. Model 595A/598A Power Measurement Capability operates over the full operating range of the Band 1 and 2 inputs on both CW and pulsed signals. 3. Phase Matrix’s Unique YIG Preselector provides an excellent combination of burnout protection, sensitivity, frequency selectivity and video immunity. The inherent frequency selectivity of the YIG filter allows counting the highest amplitude signal even with many other signals present. 4. Optional Internal Pulse Generator makes the profiling of frequency and power simple and automatic. 5. 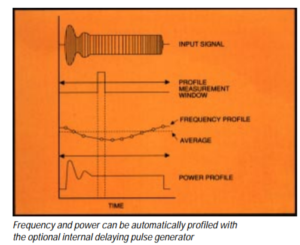 Pulse Width or Pulse Period can be measured and displayed with a touch of the Pulse Width or Pulse Period key. Pulse repetition frequency can also be easily displayed. 6. Frequency High/Low Limit allows the measurement of a lower amplitude signal in the presence of higher amplitude signals. 7. External Switching Requirements Eliminated by the use of four independent signal inputs that let the operator apply multiple signals and measure any one by merely switching the band selector from the keyboard or over the IEEE-488 Bus. 8. Dual Display For Fast, Easy Readout simultaneously provides two important signal parameters: 1) Frequency to 1 kHz resolution, and either 2) Power to 0.1 dB resolution or 3) Pulse width (or pulse period) to 10 nanosecond resolution. The three-digit (or six digits with special function mode) pulse period/pulse width display utilizes a floating decimal format with annunciators. 9. Automatic Power-Up Self-Testing and Go-to-Local allows one key stroke to switch from remote to local, or to fully initialize the system from local. When initialized, the instrument automatically executes power-up self-tests. 10. Precise Pulse Measurements Provided by the IF Threshold and Gate Outputs. These convenient outputs allow the operator to monitor exactly where within the RF pulse the sample is taken. This feature is especially useful when using external gating for frequency profiling. 11. All Front Panel Functions and Test Sequences Can Be Placed Under GPIB Control via the IEEE-488 bus for ATE applications. 12. Optional Rear Panel Inputs simplify signal routing in rack-mounted applications. 13. External Time Base Reference Capability allows the use of an external 10 MHz reference as a common system time base. Or use the output of the optional ovenized oscillator as the system time base.